Built in 1976, by F. B. Walker and Sons Incorporated of Pascagoula, Mississippi (hull #215) as the Cindy Cole for Energy Transport Services Incorporated of New Orleans, Louisiana. 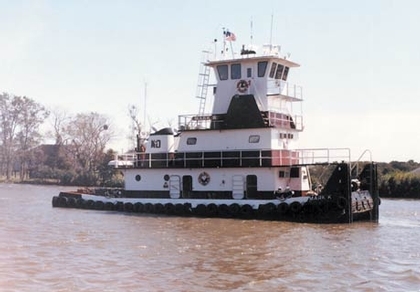 In 1983, the tug was acquired by the Iowa Marine Repair Corporation of Morris, Illinois. Where she was renamed as the Helen Kolbe. In 1989, the Iowa Marine Repair Corporation renamed the tug as the Linda B. In 1991, the Iowa Marine Repair Corporation became RRS Transportation Incorporated of Morris, Illinois. Where the tug retained her name. In 1991, she was acquired by McDonough Marine Services Incorporated of Metairie, Louisiana. Where the tug was renamed as the John G.
Re powered in 2004, she is driven by two, Cummins KTA19-M3 Diesel engines. With Twin Disc reduction gears, at a ratio of 7:1. Turning two, stainless steel, fixed pitch propellers. She is a twin screw towboat, rated at 1,200 horsepower. Cindy Cole, Helen Kolbe, Linda B.